The Superfurry Earl Grey Stache Wax 2.0, oh what a joy! Yes yet again Superfurry gets a Golden Beard Award and they are one of only seven brands that have been awarded it as a brand award. 3 Waxes 1 Butter 1 Resin: Created to keep that perky french handlebar crisp all day, or as a starting styling wax to create the most outrageous Dali or english style wingspan stacho. The scent is a triumph and I literally cannot get enough of it, it is first smoky and that is from the Indonesian Vetiver and then you get a woodsy background and it is just amazing. Handmade, all natural, assessed and approved and one that will go on my favourite products list! 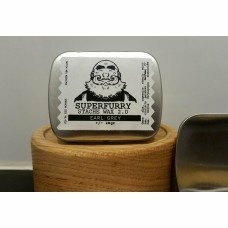 The Superfurry Earl Grey Stache Wax 2.0 comes in a 28gr tin and costs €12.50 from the Superfurry website.